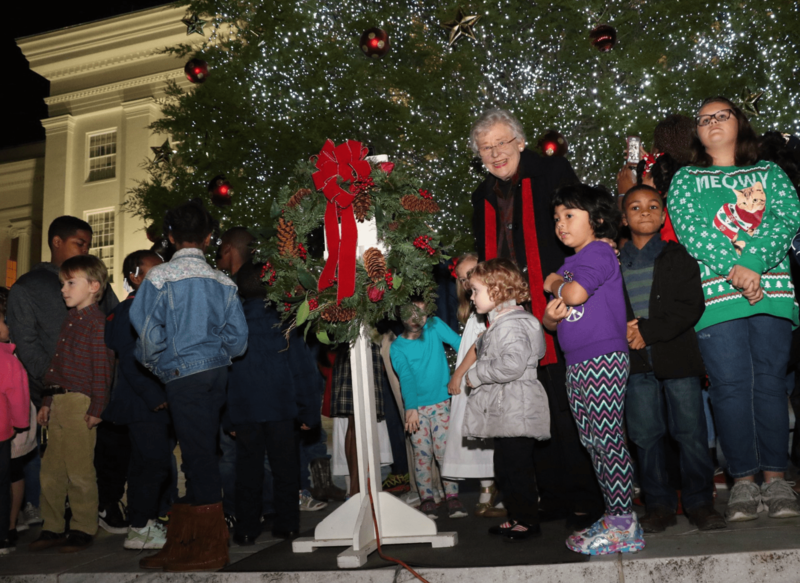 It’s beginning to look a lot like Christmas, especially after the tree lighting at the steps of the Alabama Capitol in Montgomery on Friday night. The state capitol was packed with hundreds of festive onlookers as they watched Gov. Kay Ivey press the button that turned on the more than 35,000 LED lights, setting the 35-foot Eastern red cedar aglow in all its Christmas glory. The tree, donated by Ray Allen owner of Feather’s Properties in Bullock County, was adorned with 100 ornaments which included 67 stars representing each of Alabama’s counties. Friday night’s tree lighting ceremony included a reading of the Christmas story by five Alabamians who are making a difference in their community: Montgomery Police Officer Lt. R.K. Johnson, Montgomery Firefighter Lt Kenneth Peoples, Dozier Elementary School Coach and Teacher Corey Jackson, local student Angel McMillian, and retired Brigadier General Ed Crowell. Special musical performances were provided by The McFarlane’s and the 151st Army Band, Alabama National Guard.